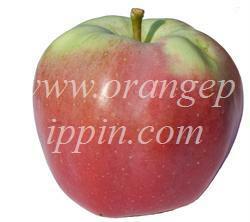 Northern Spy is a very old-fashioned American variety which retains its popularity. It is a typical winter apple variety, picked in late October or early November, and then used through the winter months. It keeps in a cold store well into spring. Northern Spy is well known for its winter-hardiness. It is a naturally vigorous variety which will produce a relatively large tree, however whilst it grows strongly it can take longer than most apple varieties to come into bearing, and it also has a tendency to lapse into biennial bearing. 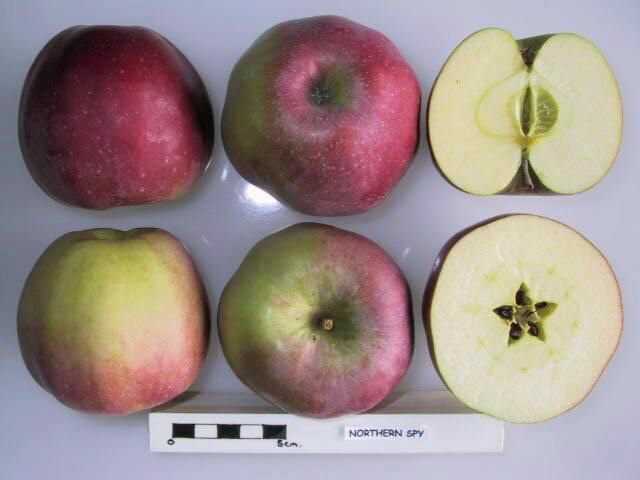 Northern Spy can also be used as a rootstock for other varieties. It is one of the parents of the popular MM106 apple rootstock - more info here - and was chosen specifically because of its resistance to woolly aphid. 14 years until first bloom on our full size specimen. Needs heavy pruning to develop a strong and spreading structure- wants to grow pyramidally, with many small branches. Good central leader persistence and sound branching. Lots of wood and leaf when grown in a fertile spot. Extremely late leaf out, while holding leaves well into December, which can be a problem when early (wet) snow bends the branches. Due to the lateness of leaf out, this is an excellent variety for understory cropping, lawn, or pasture- we grow strawberries, peas, or early potatoes under it. Large and attractive tree for landscaping. We're in zone 4b, on a dense silt loam, somewhat poorly drained/some panning @ 14-20". 50-60" annual precip- evenly spread- with 160-220" of snowfall. Spies are the best combination of taste, versatility, and keeping that I've found- a perfect 'only one tree' variety as long as you have pollinators flowering at the same time, and within a 1/4 mile of you. If not, you can graft on a couple of branches. I fell in love with this apple when I was 4 yrs old. My mom and I went to a pick-ur-own orchard. Up the slope in the back, I found these absolutely HUGE apples that I could only hold with both hands. One bite and I was hooked. Nowadays they are almost impossible to find. Even here in apple country. (Romeo, MI is well known for its orchards). Dan from Ontario is spot on with his description about apple pie. It's not too mushy, nor is it too stiff. The texture is just right. Before they became so hard to find, there was a time when they were also used as part of the variety blend to make cider. Northern Spy makes the best pie. Newly planted trees are notoriously slow to bear fruit, which is why you seldom see it planted commercially anymore. Have a 57 year old Northern Dwarf Spy Tree. It has produced every year. Some a lot more than others. We have had to suport the lower limbs. Our Tree Man injects it to keep it very healthy. Here in Western Michigan we have the biggest northern spy this year. As my mother used to say if you wa t to make a good pie use a northern spy. Also love the for apple sauce. To get Spies these days you usually have to head to a good Farmer's market or an orchard. As mentioned, these are simply the best pie apples, producing absolutely perfect texture (soft yet toothsome) and good rich flavour (a hearty aroma, vanilla notes, perfect sweetness). Bake it with Spies and get ready for everyone to ask your secret. Great eating apples, too--excellent crunch, acid and sweet in what feels like a 50/50 balance. Northern Spy is my favorite apple, but I've not found them in NM. We had them back east (NY and New England) where I grew up, and in Western MI, where every fruit grows (!). I absolutely LOVE making pies with Northern Spy apples - yum! Central PA -- small crop due to the late spring, but the resulting fruit is excellent. My favorite of all apples, and getting hard to find. Our Spys are simply Gi-normous this year. It has taken many years for our new trees to come into production, and it was worth the wait. What a beautiful, sweet-tart, juicy apple. Spies for pies! The Northern Spy is one of two varieties I use for pies from mid-autumn on. I try to buy them in upstate New York rather than in Massachusetts, where I live, because I think Northern Spies grown in colder climates are better than those grown in milder climates. This apple had the pequliar flavor of bubble-gum and minty leather. I would recomend it to people who like bubble-gum and or minty leather. Was disappointed with this apple. After everything I had read, I anticipated a much better experience than what I got. Mushy texture, slight tang but overall rather bland. Might have been an older apple. Northern Spy is not an easy-to-find apple, but if you find them, buy them! They seem to prefer colder climates, and are not generally ready to pick until mid-October. They keep well, and if you can keep the family from eating them out of hand, they make the best apple pies, bar none! We just moved back to the Endless Mountains countryside and found a very mature apple tree in front of our house. My parents had it pruned as a gift to us, and now it is bearing lovely Northern Spy apples. We have picked a few early, and already they are delicious! Surprising to see such good bearing on an old tree. I was given a huge tree that was to be moved and hauled away from a bad location. I had it taken to my place in the Foothills of Mt. Rainier in the state of Washington where it is still flourishing. I am going back there this summer and try to get a cutting from it. The apples are so delicious and make an excellant pie. My grandparents grew Northern Spy apples on their farm in Coopers Plains, NY. I grew up enjoying my grandmother's "deep-dish apple pie" (a pie baked in a shallow rectangular Pyrex pan with only a top crust) made from those apples. Wonderful! The Northern Spy was developed around present-day Bloomfield, NY, quite accidentally, by early settlers, the Chapin brothers. Search Northern Spy for the full history of their serendipitous route to this (plus two other recognized varieties), from the same planting & re-locating of young apple trees. Around here, we call 'em Northern Spies or just Spies, not Northern's Pie. Many people still prefer & ask for this apple at market. I bought an old farm in 1998 that was overgrown. In the woods (2' spruce and popple) there were apple trees. we cut about 3 achers of the woods carefully marking the apple trees in rows. One tree that had fallen over but not dead had fruit the next year. We pruned the others back about 1/3 and got some apples from almost all of them. I had a 50+ year old 3rd generation orchard owner come to tell me what to do from there. He told me to cut all the macs. they had scab to deep to spray out. but keep the spy untill I could graft from it he said it was the best tree he had seen. clean larg apples from a tree laying on the ground. I just picked 2 bushell of 3 to 4 inch apples from a 12' tree 5 years after grafting. I have 5 more trees growing on wild root stock from that tree but it is still producing 4-5 bushel laying down. A friend shared a pie made with the "Northern Spy Apple," and it was great. I would like to know where I can purchase some to share with my family. These a big lumpy funny-looking apples, but my goodness I think they are my favorite. Tart and perfect and my go-to apple for galette aux pommes. Yum! Hi Nancy.....from Nancy!!!! I've read different things about the odd name of this apple. This probably means nobody knows for sure. I've read that it's possibly "Northern's Pie Apple". That explanation makes most sense to me, since it was (& is) mostly used for pies......it used to be a dessert apple,too,But not until it "mellows" after long storage. I'm thinking that's why the "Northern's Pie" explanation is the right one.....it was definitely the #1 pie apple in Ontario(it's great for cooking, right from harvest till Spring) But only used for dessert, for a few months .... It really is more of a pie apple. Around here (Ontario) people who're familiar with it(mostly older people) usually just call it "Spy". Where can we purchase these apples? I have tried our local grocers, and some high end ones, and still no northern spys. In a recent conversation with friends about apples, the question arose as to why "Northern Spy" was so-named? Any answers? We found an ancient apple tree in a mountain gully, bearing golden/green with slight blush or brown streak from the stem over the shoulder of apple. It seems much like the Northern Spy trees I found in upstate New York. This tree ripens in early October, and is located next to an ancient mining road. Maybe a Johnny Appleseed Northern Spy? We picked a few that made great pie and sauce. Apples kept until March in dry, cool place. Buried the cores and pealings and VOILA 2 years later were the baby trees! About the 5th year growing at same elevation of mother tree, we had the first fruits!. Using Dr.Robert M. Crassweller's system, we sprouted seeds and planted indoors and have 13 healthy plants now, each about 8 inches tall. Question: Do we prune the top off this plant and move to gallon containers outside now that frost is past? HELP??? Any advice for culture of these young plants will be greatly appreciated! I have only had this apple once, some 20 years ago. I don't clearly recall the flavor, although I recall that I enjoyed the apple. I do recall that the flesh of this apple is naturally pale yellow in color, not white. We have an apple my great grandfather planted in the late 1800's or very early 1900's. It is not very large, has very deep, bright red color with tiny white spots on, white meat very juicy and flavourful. May have come from Johnnie Appleseed in a covered wagon. I would like to know variety.